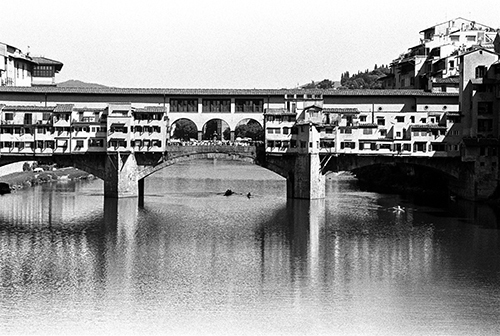 This landmark bridge in Florence, Italy dates back to the 1300’s and has an interesting history which can easily be looked up. Currently, there is a street down the middle with mainly gold shops on either side. Centuries ago, there were many different kinds of shops including fish sellers, hide tanners and butcher shops. It was easy to get rid of the waste by just dumping it into the river below. I made this image with a Leica M6 camera on Ilford 35mm black and white film.